Altogether there are about 373,000 people in China who belong to the Dongxiang nationality. 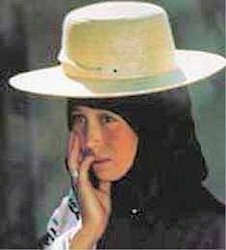 The Dongxiang population is mainly concentrated in the Dongxiang Autonomous County of the Xinjiang Autonomous Region, and Gansu Province, as well as some other counties and cities such as He Zheng, Linxia, and Lanzhou. The Dongxiang language is a branch of Mongolian, belonging to the Altaic language family. Most Dongxiang people can also speak Chinese, and as there is no written Dongxiang language, they use Chinese characters for their writing. 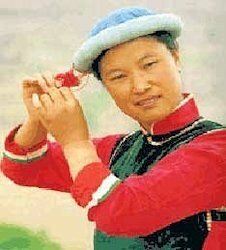 The Dongxiang, a largely Islamic people, mainly rely on agriculture and raising livestock to make their livings. 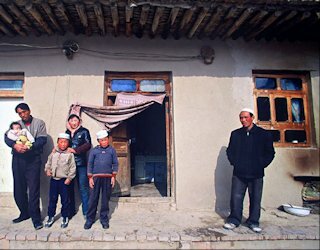 The name Dongxiang was given to them because they live in an area of Gansu known as the Dongxiang (Eastern Village) region. In the 13th century, a number of Mongolian Muslims came to Ninxia, Gansu. Gradually, they mixed with the local people who were of Han, Hui, and Tibetan descent. These were the forefathers of the Dongxiang. The Dongxiang art form known as "Hua'er" is popular and well known among the Chinese people. The Dongxiang offered support to the Red Army in the years before 1949, and many Dongxiang participated in the civil war against the KMT. The Dongxiang Autonomous County was founded in 1950, one year after the founding of China. Since the implementation of a series of social reforms, the education and economy of the Dongxiang have improved greatly. The Dongxiang are closely related to the Mongolians. They speak a Mongolian language and are Islamic.